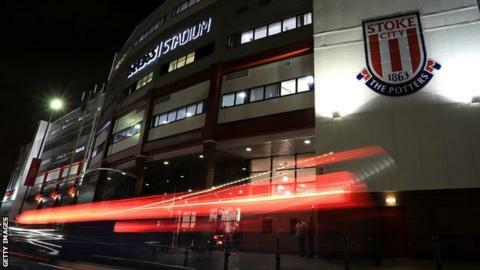 Stoke City recorded pre-tax losses of £30.1m in 2017-18 - the season they were relegated from the Premier League. It is the first time the club has recorded a loss in five years, with the Potters reporting profits of more than £4.9m in the 2016-17 season. An increase in wages, dip in broadcast revenues and a £29.4m write down of player values contributed to the deficit. The Potters still spent more than £52.2m on new players in the summer. Tom Ince, who joined for a reported £10m from Huddersfield, is among those additions. But Xherdan Shaqiri's £13m move to Liverpool helped the Staffordshire side bring in more than £22.7m in player sales. Stoke's debts also rose in the 12 months up to 31 May 2018, with loans to parent company Stoke City Holdings, controlled by Denise Coates, increasing from £75.7m to £122.7m. Kieran Maguire, a football finance expert at the University of Liverpool, said without Coates' commitment the club would be in "serious financial problems". "The Coates' love Stoke and Stoke love the Coates', so the club is secured going forward," he told BBC Sport. "But it is quite scary that a club in the Premier League was losing that sort of money, when you think of the level of income received compared to the Championship. "Stoke are now looking at a tough 2018-19 season, and they are not performing particularly well as it stands. They are faced with that horrible perfect storm which see them in financial distress without the loans." Despite their relegation from the top flight, Stoke's matchday revenue rose from £7.1m in 2016-17 to £7.7m. However, finishing in the bottom three saw them bring in £100.9m from broadcasters, which was almost £8m down on the previous year. Analysis of Premier League accounts showed that more than half of clubs in the 2016-17 season could have played in empty stadiums and still made a pre-tax profit thanks to the current broadcast deal. Stoke were not among them.